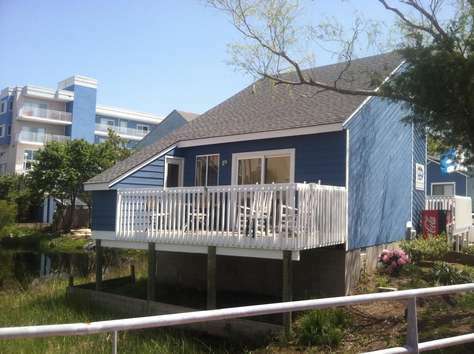 This home (Unit #12 at the Beach House) is located on 75th St and the bay and offers 2 bedroom plus a loft and 2 baths. It has parking for one car, and of course an amazing view with great porch! Although this unit is still owned by BeachHouseOC it is now professionally managed by Vacasa and all reservations must be made through their site at www.vacasa.com/unit/22207. When booking through Vacasa there is only a 2-3 night minimum and you are provided all linens, blankets, towels, soaps, etc. If you prefer to stay in a property still managed by BeachhouseOC please check either Talbot St or 5th St locations. 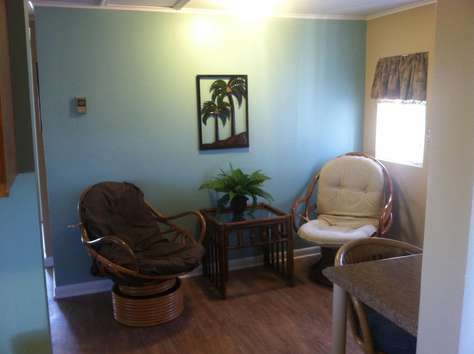 This home (Unit #13 at the Beach House) is located on 75th St and the bay and is a small 2 bedroom 1 bath bungalow. 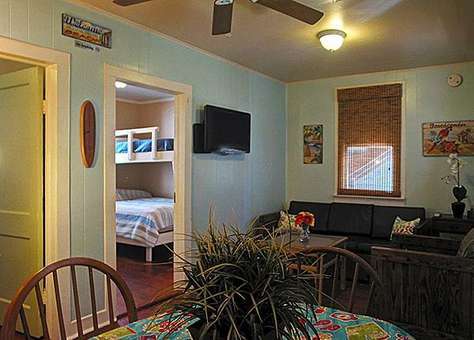 It has a full kitchen, small living area, two small bedrooms, and a nice little front porch with great view of the bay. Although this unit is still owned by BeachHouseOC it is now professionally managed by Vacasa and all reservations must be made through their site at www.vacasa.com/unit/22208. When booking through Vacasa there is only a 2-3 night minimum and you are provided all linens, blankets, towels, soaps, etc. If you prefer to stay in a property still managed by BeachhouseOC please check either Talbot St or 5th St locations. This is a large 4 bedroom 3 bath unit with living room, full kitchen with dishwasher, a great back porch, parking for five cars, and of course an amazing view! It is the first floor of a duplex with the second floor being available for rent as well. Bedroom 1 has a queen bed plus bunk-bed, bedroom 2 a king plus bunk-bed, bedroom 3 king plus bunk-bed, and bedroom 4 a queen bed. Central air & wifi included. Although this unit is still owned by BeachHouseOC it is now professionally managed by Vacasa and all reservations must be made through their site at www.vacasa.com/unit/22209. When booking through Vacasa there is only a 2-3 night minimum and you are provided all linens, blankets, towels, soaps, etc. If you prefer to stay in a property still managed by BeachhouseOC please check either Talbot St or 5th St locations. 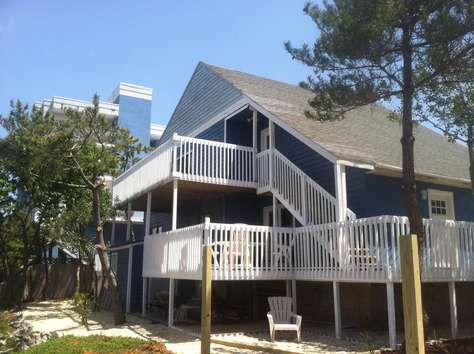 This apartment (Unit #15 at the Beach House) is the top floor of a duplex and has 4 bedrooms and 2 baths. It has a large porch, parking for 4 cars in a row, and of course another amazing view! Although this unit is still owned by BeachHouseOC it is now professionally managed by Vacasa and all reservations must be made through their site at www.vacasa.com/unit/2210. When booking through Vacasa there is only a 2-3 night minimum and you are provided all linens, blankets, towels, soaps, etc. If you prefer to stay in a property still managed by BeachhouseOC please check either Talbot St or 5th St locations. 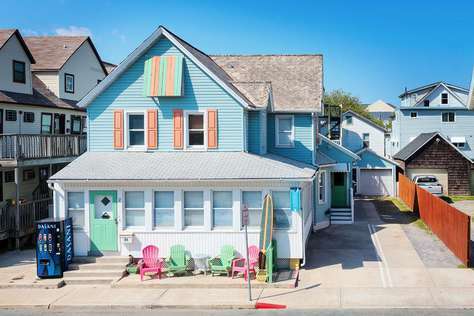 Unit #20 at The BeachHouse is located at 509 Baltimore Ave (5th St) We will be closing on the property February 15, 2019 and will begin upgrades/remodeling immediately. The building consists of 4 identical units, each 3 bedrooms 2 baths, set up to sleep 10. This listing is for the first floor south side unit. Bedroom #1 has a double bed plus bunk bed, bedroom #2 has a double bed plus bunk bed, and bedroom #3 has 2 bunk beds. Pictures are of the current condition of the property but we have already begun to re-paint, re-decorate, and overall spruce up the units. Pictures will be updated as it comes together. Reserved parking for one car, outdoor grill, great front porch, and unbeatable location. 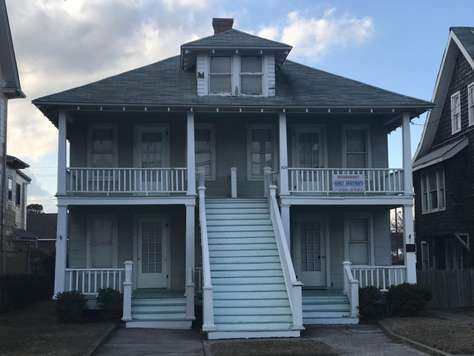 Unit #21 at The BeachHouse is located at 509 Baltimore Ave (5th St) The building consists of 4 identical units, each 3 bedrooms 2 baths, set up to sleep 10. This listing is for the first floor north side unit. Bedroom #1 has a double bed plus bunk bed, bedroom #2 has a double bed plus bunk bed, and bedroom #3 has 2 bunk beds. The property was just purchased in March of 2019 and pictures are of the current condition of the property but we have already begun to re-paint, re-decorate, and overall spruce up the units. Pictures will be updated as it comes together. Reserved parking for one car, outdoor grill, great front porch, and unbeatable location. 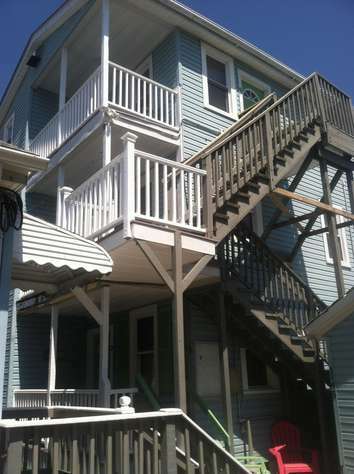 Unit #22 at The BeachHouse is located at 509 Baltimore Ave (5th St). The building consists of 4 identical units, each 3 bedrooms 2 baths, set up to sleep 10. This listing is for the second floor south side unit. Bedroom #1 has a double bed plus bunk bed, bedroom #2 has a double bed plus bunk bed, and bedroom #3 has 2 bunk beds. The property was just purchased in March of 2019 and pictures are of the current condition of the property but we have already begun to re-paint, re-decorate, and overall spruce up the units. Pictures will be updated as it comes together. Reserved parking for one car, outdoor grill, great front porch, and unbeatable location. Unit #23 at The BeachHouse is located at 509 Baltimore Ave (5th St) The building consists of 4 identical units, each 3 bedrooms 2 baths, set up to sleep 10. 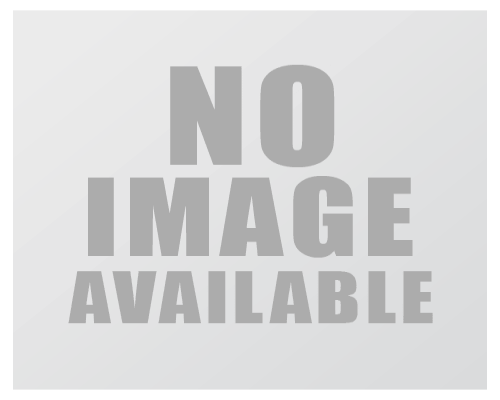 This listing is for the second floor north side unit. Bedroom #1 has a double bed plus bunk bed, bedroom #2 has a double bed plus bunk bed, and bedroom #3 has 2 bunk beds. The property was just purchased in March of 2019 and pictures are of the current condition of the property but we have already begun to re-paint, re-decorate, and overall spruce up the units. Pictures will be updated as it comes together. Reserved parking for one car, outdoor grill, great front porch, and unbeatable location. 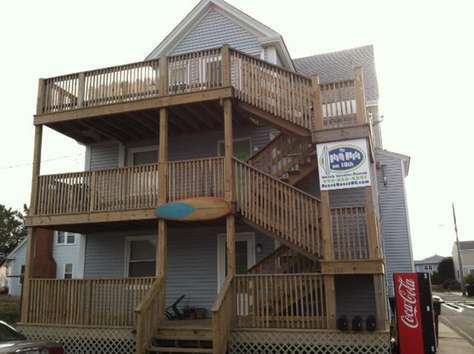 Unit #24 at The BeachHouse is located at 509 Baltimore Ave (5th St). This listing is for the first floor of the small cottage in rear of property. It is a small efficiency with full bed and pull out couch. Unit is currently being repainted/decorated and pictures will come soon. 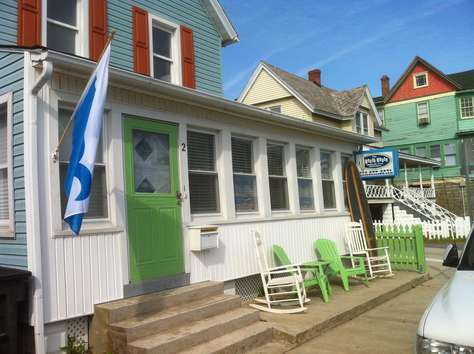 Unit #25 at The BeachHouse is located at 509 Baltimore Ave (5th St). This listing is for the second floor of the small cottage in rear of property. It is a very small unit with tiny bedroom with full bed plus futon in main area. Unit is currently being repainted/decorated and pictures will come soon. 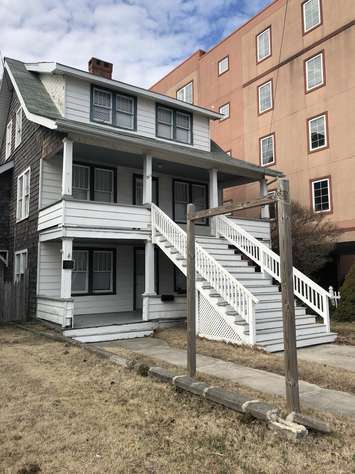 Unit #26 at The BeachHouse is located at 511 Baltimore Ave (5th St) First floor apartment in historic home in downtown Ocean City built in 1935. There are few or these homes still left for rent. There is reserved parking for 1 car, outdoor grill, great front porch, and unbeatable location. 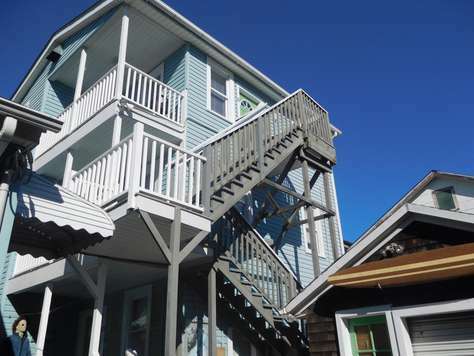 Unit #27 at The BeachHouse is located at 511 Baltimore Ave (5th St) Second& thrid floor apartment in beautiful historic home in downtown Ocean City built in 1935. There are few or these homes still left for rent. There is reserved parking for 2 cars, outdoor grill, great front porch, and unbeatable location.